Crime Report: Vincent Gordon's report is seen. Click on white weapon, carpet and blood on the report. See a check mark. Mr. Flatham, night watchman: Read the report. Click on green check mark to finish the page. 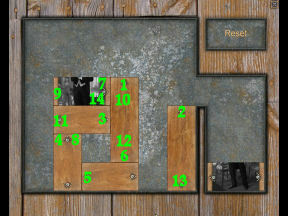 Click on the carpet, carpet traces, matches and green cloth. 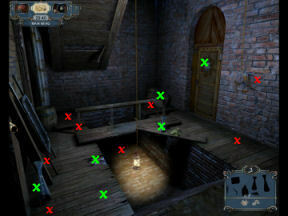 Lower the lamp by clicking on crank. Use matches on lantern. Landlady's note: Pick up the pieces of paper (Landlady's note). 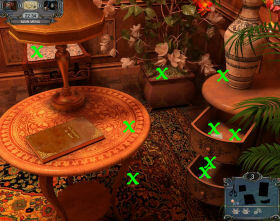 Click the landlady's note on the puzzle icon. Put together the pieces of paper. Click hold drop the pieces at right side of screen. Right click to turn the pieces. 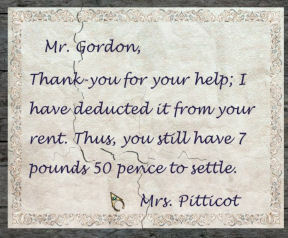 Mrs. Pitticot, landlady: Read the report. Click on green check mark to finish the page. 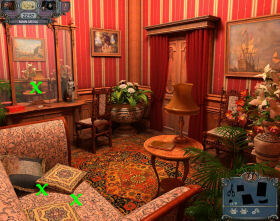 Gordon's Chamber: Click on red paint on floor, sponge on easel and water pitcher on table. Look close at cabinet. Take paint brush and knife. Painting: Look close at painting at right corner. Use paint brush on water pitcher. Use (click-hold-wipe) the brush all over the painting. Then use (click-hold-wipe) the sponge to remove the superficial paint to uncover the picture of Mary. 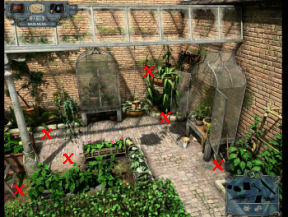 Garden: Click on the menacing letter, knife, mud traces, ashes, shoe print and garden key. Use the key on the closed glass cabinet at top. Move the pot at center twice. Take the page book. Page book decoding: Click the page book on the puzzle piece below. Move the decoder to center of the page book with the red check mark on letter L on the hole at center of the decoder. Click on each hole (letter) to enter it at lower left. Read Mary's threatening note. Mary Summer: Read the report. Use the magnifying lens to look and then click for the silhouetted items on the left. Box: Click on fake knife, paint and lipstick. 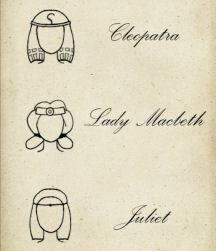 Wig Paper: See a sketch of the wig and headdress of Cleopatra, Lady Macbeth and Juliet on the dresser. Collect headdress from shelf and also from table. Place the appropriate headdress on the wigs as shown by the framed paper on the dresser. Secret cabinet opens. Take Vincent's message. 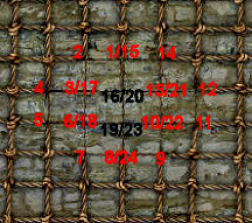 Vincent's message decoded: This is a random puzzle. Click Vincent's message on the puzzle piece. See the decoding puzzle. There are 2 clues already: the pipe of Holmes and the anatomy sketch of Da Vinci. At top set of letters, click the letter below the alphabets to see a set of new alphabets to choose from. Click on the letter below the top alphabets and then click on the correct letter to exchange it. All the letters below will change to the chosen letter. 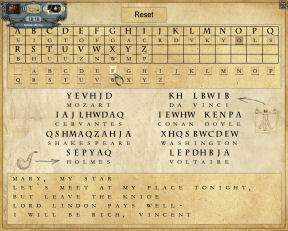 For example from the clues given: the pipe letters are for Holmes and the anatomy sketch letters are Da Vinci. Replace those coded letters with the clue letters. Left column: Mozart, Cervantes, Shakespeare, Holmes. Right column: Da Vinci, Conan Doyle, Washington, Voltaire. Message: Using the misspelled letters on the message, complete the decoding. Backstage: Pick up the knife, cap and the set traces. 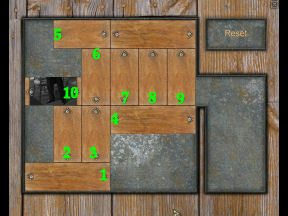 Click on the chest at bottom left and see a puzzle. Black and white tiles: The object of the puzzle is to have all white tiles on the left and all black tiles on the right. There is only one tile that can be moved at a time. Click on the tile and it will move. Be sure that you keep alternating colors as you move. White - W; Black - B. Take the red and blue filters. Use the 2 filters on the lamp and see a message on the wall. Click on the message. Mr. Thomas, stage manager: Read the report. Click on green check mark to finish the page. Edward Aston, director: Read the report. Use the magnifying lens to look and then click for the silhouetted items on the left. Crime Report: Vincent Gordon's body is now seen. Use the magnifying lens to look and then click for the silhouetted items on the left. Lord Lindon: Read the report. Click on green check mark to finish the page. 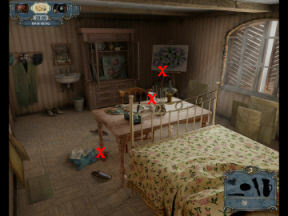 Click on blood, footprints, box with pieces and knife. Click twice on the statue to read what is written and place in the frame. Raise the mattress to get a revenge note. 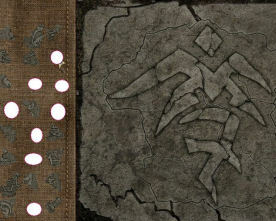 Tattoo: Click on the tile on the wall to reconstruct Brian Willis' tattoo. The pattern to reconstruct is seen on the right side of the arch. Click on a piece at left and it will automatically go to the appropriate place. Thanks, Ana! Take the shares paper inside the opened secret compartment. Hall: Click on footprint, grid paper and red paint. 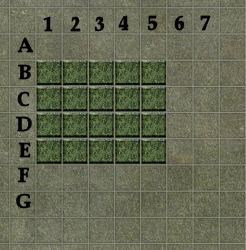 Grid puzzle: Click the grid paper on the puzzle icon. Click on a square to form an arrow. See letters at bottom of completed puzzle. Look close at book shelf and click on a book at IJ OP and UV shelves or the letter labels. Office: Click on ashes, cement powder and paper knife. On close up of Lord Lindon's portrait, click on button by his breast pocket. Safe: Hover the cursor on a tile at the end of a row or column and see arrows. 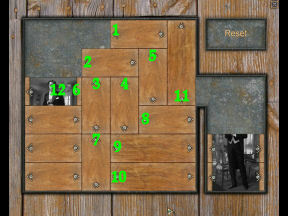 The arrows shows the directions that set of tiles can be moved. 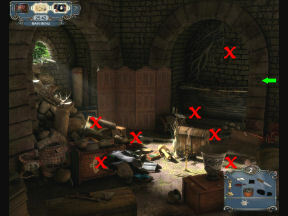 Click on the arrow to move it in the direction wanted. 1. Push column 2 up once. Push top ball of column 2 to the left once. 2. Push column 3 down 3 times. 3. Push top tile of column 2 left once. 4. Push column 2 down 2 times. 5. Push row B left side to the right once. 6. Push row B right side to the right twice. 7. Push row C right side to the right once. 8. Push row D right side to the right twice. You now have column 6 and 7. 9. Push column 7 down twice. 10. Push last (right side) tile of row E to the left once. 11. Push row F to the right twice. 12. Push bottom of column 3 up once. 13. Push row G to the right twice. 14. Push row F to the right twice. 15. Push row G to the right once. 16. Push bottom tile of column 7 down once. 17. Push row F to the right once. 18. Push last 2 tiles of column 7 down once. 19. Push last tile of column 7 to the left once. 20. Push top tile of column 7 down once. 21. Push row C at right side to the right once. After opening, take the feather from top small shelf and the invisible paper from top shelf. Brian Willis, laborer: Read the report. Use the magnifying lens to look and then click for the silhouetted items on the left. Lord Lindon: Read the report. Use the magnifying lens to look and then click for the silhouetted items on the left. Mr. Yelling, barman: Read the report. Click on green check mark to finish the page. Lady's sitting room: Click on the items. Click on dagger on wall. Look close at right side of the room and click on nail on table above the book and the poem-paper hidden right side of the pot by the wall. Look close at dresser and click on powder container and the red box. Red box puzzle: Find the correct set of numbers that make a code. There are only 5 tries. This is a random puzzle, so no solution is given. The arrows cycle the numbers. The bar with the number below is the enter bar. There is a reset bar. The wrong numbers are shown by red buttons and if the number is correct the button turns green. I did this by entering 1 2 3 4 5 1 2 3 4 5 on the first try. See if button(s) turn green. Then I raise the red buttoned numbers one or 2 up bypassing the numbers that are already green. Do not forget the zero. Good luck. The box opens. Click on the scissors and see another puzzle. 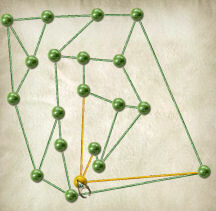 String puzzle: The object of this puzzle is not to have any thread over another thread. 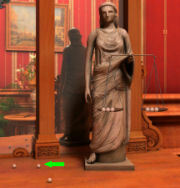 Click hold and drop a ball to move the thread that is attached to it. The worked on thread is yellow and the overlapping threads are in red. Move a ball as far out as you can and see if the other strings are cleared. If you see a red line, move the ball to an open space either inside or outside the others. Turn all the threads to green. Take ring when the secret compartment opens. 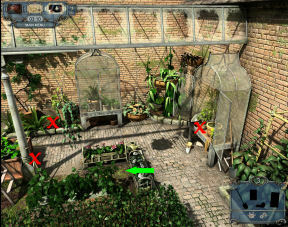 Garden: Click on shovel and ribbon. Use spade on the ground where the green arrow is pointed. Get Oak's play card. Look close at the open glass cabinet at right. Move the pot at left to see another puzzle. 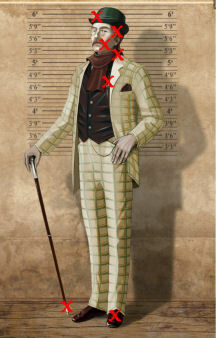 Slider puzzle: If done correctly, see a picture of Gordon in dress coat. 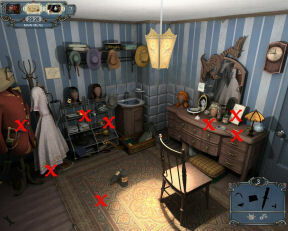 Gordon's chamber: Pick up wig on rack. Wig on rack: Use the magnifying lens on the Aston label of the wig. Move the wrapped paintings at right of room and under the window. Take key. Use the key on drawer to get dress coat. Take hair from left foot of bed. Move bed and see a new puzzle. Box puzzle: The object of the box puzzle is to make more squares than the computer. Watch the lines made by the computer. If there are 3 lines already, make the fourth line to make a square. The computer is tricky. Make lines that will not make a square or later in the game, make least number of squares possible. Good luck. Read Lord Lindon's note. 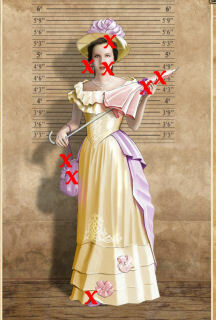 Lady Lindon: Read the report. Use the magnifying lens to look and then click for the silhouetted items on the left. Garry Oak: Read the report. Use the magnifying lens to look and then click for the silhouetted items on the left. Box: Click on 2 wheels, 2 screwnuts, wrench, theater notes and list of costumes. Cart: Use the wheels on the cart with books on the floor in front of the plugged water filled sink. Use the nuts on the attached wheels. Use the wrench on the nuts. It will automatically move to open the sink cabinet. 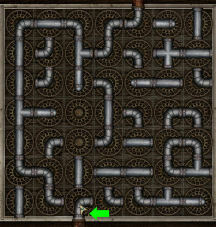 Pipe puzzle: Turn pipes so that there is a complete connection from top to the bottom exit pipes. Block pipe branches. 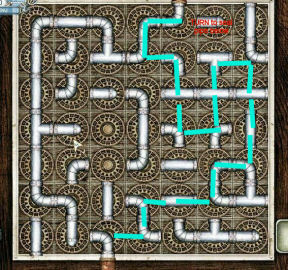 In the picture below turn the bottom pipe with cursor to the left. Take the hair from the drained sink. Turn the pipe in red to seal the bottom one. Backstage: Click on cloth, cane print, dirty fibre, footprint, blood and fishnet. Net puzzle: Click net on puzzle piece. The object of the puzzle is to get threads on the frayed part of the net without going over the non-frayed area. Click on the numbers in order 1-23. Use the net on the dove in the background. Take key from its leg. Storeroom: Take spoon, knife, blood, ashes and red shoe polish. Wall hooks: Click on the wall hooks at right wall. Use spoon to remove a screw. Take statue. Trap door tumbler puzzle: Use the spoon on the trap door. See a tumbler puzzle. The aim is to arrange the numbers at the center from 1 -10. The closest groove to the center can have several numbers but only if they are in sequence. The outer groves can take only single numbers. Click hold drop the numbered metals. Place 9 and 3 on outer grooves. Place 7 8 and then add 9 and later 10 to inner groove. While the other inner groove has 5 4 3 2 1. Then arrange 1-10 at center groove. Take mask and hair from the edges of the trap door. Cement works: Click on 3 L bottle, 5 L bottle, greasy substance, hair, ashes and 8 sun rays. 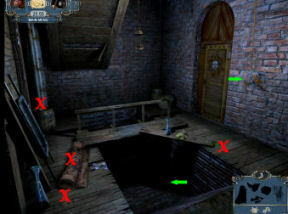 Door: Click the 8 sun rays on the door. See a light beamed to the other wall. Click on the lit wall. Water weighing puzzle: The aim of the puzzle is to place 4 units of water over the #4 scale. Fill the 5 units flask with water from the vat. Use-click the filled 5 units flask on the 3 units flask to fill it leaving 2 units. Empty the 3 units flask on the grate drain. Use-click the 5 units flask (with 2 units) on the 3 units flask. Use-click the filled 5 units flask on the 3 units flask to add 1 unit to it leaving 4 units. 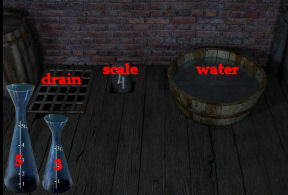 Place the 5 units flask that contains 4 units water on the scale. Take the note from the opened compartment. 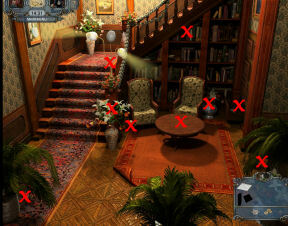 Hall: Click on newspaper, 3 stem pieces of lamp and 3 bulb pieces of lamp. 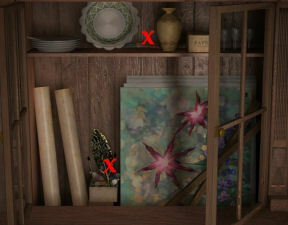 Click the vase on the floor by the book shelves and see the drawer open. Take the piece of lamp (bulbs) and the drawing of the lamp. Assemble the lamp on the banister. Click on a book that is lit by the lamp. Painting difference puzzle: Click the book on the puzzle piece. 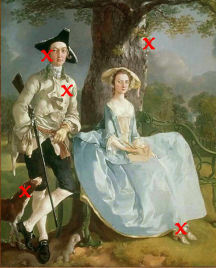 Click the part of the painting that is different from the other one. Get a map of the Lindon Estate. Click on candelabra (lit candle), candlestick, police notice, coin and crowbar. Screen: Move the screen at background. Use the candelabra from bottom left and move it around to pick up the ashes. 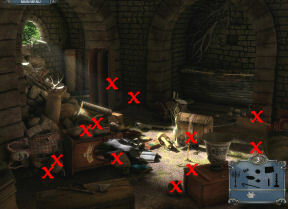 Clown: Use crowbar on the 4 rocks over and in front of the clown stand lying on the ground at bottom left. It will be placed upright. The footprint is in front of the clown on the ground. Use the candlestick on clown. Look close at clown and see a puzzle. Card Puzzle: Insert a coin on slot. Pull down the candlestick arm. The object of the puzzle is to pick up a card from the selection on the left and click that card on the right hand of the clown. If it is the logical correct card, another selection is seen. If incorrect card, start over with the coin, arm and card selection. First run: Clown shows 1 of diamond, 2 of spades and 3 of clubs. Select 4 of hearts from left and place on hand. Second run: Pull arm. Clown shows 2 of spades, 3 of hearts and 5 of diamonds. Select 8 of clubs from left and place on hand. Third run: Pull arm. Clown shows 1 of heart, 3 of clubs and 3 of diamonds. Select 1 of spades from left and place on hand. Coat of arms: Click to open white book on desk. 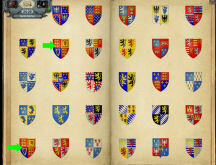 Click to select similar coat of arms. 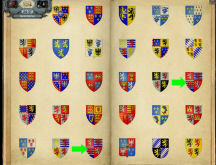 Get 3 coat of arms. 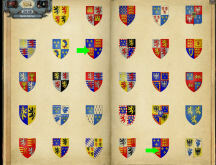 Then place them on the empty coat of arms frame on left wall. Fireplace is seen. Open the fireplace. Take ashes. Safe Lock: Look close at safe to see the lock. The object of the puzzle is to get an end result of 82 after entering numbers and doing the mathematical processes. The math processes is from left to right: / is division, - minus, + addition x is multiplication. Enter any 2 similar numbers for the first 2 digits. 6/6 - 0 + 3 x 3 x 9 = 82. 6/6 is 1 minus 0 = 1. 3 x 3 = 9 x 9 = 81. 1 + 81 = 82. Thanks, Ana! Take the money and the hair. Lady's Sitting room: Collect 2 pearls from sofa. Look close at right side of room. Take 5 pearls. Open the 2 drawers. Take 2 pearls, opera letter and ribbon. 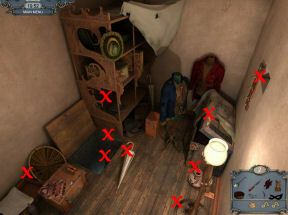 Look close at the dresser after collecting items. 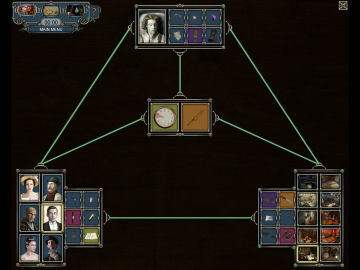 Pearl weighing puzzle: Look close at the scale. The object is to get even weighing after using all 9 pearls. Add one pearl at a time to find out which of the pearl has different weight than the others. Take that odd pearl out of the pan if found and replace with a pearl that gives an even weighing. With 3 more pearls to go (the odd weight pearl one of them), the scale with pearls should be even. Then add 2 pearls to one pan and the odd weight pearl one on the other. The secret compartment of the mirror opens. Take the mother's letter at right. Picture album: Take the scissors from the box at left and use it on the close of the picture album page on the left. Click the scissor on the edges of the bottom picture and the click scissor on the picture itself to get a Vincent mother's picture. 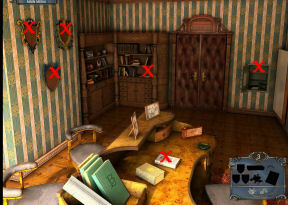 Laboratory Table (can be done several times earlier in the game): Look close at the lab table on the right. The evidences collected are at the bottom of the page. Take a ring, cloth or ashes evidence and place it under the microscope. Use the scalpel to cut and then use the tweezers to take a piece; if not use tweezers only: 1 ring, 4 green cloths, 5 satin ribbons, 1 painters cloth, 2 bandages, 1 nail with red paint and 5 ashes (one cloth ashes). For invisible letter, place the invisible letter on the pan over the burner. Click the burner several times until words are formed on the letter. Read what Lord Lindon thought. For grease (2 of them) and one dirty fiber, place the bowl over the pan that is over the burner. Place the grease in bowl. Add solvent and then water. After the dirty fiber is cleaned, use it on the microscope and take a thread. For 2 powders (one in container), place powder on bowl. Add water and click on burner. 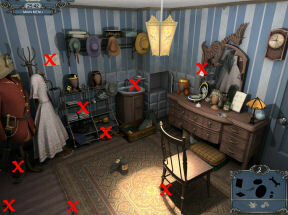 Deduction board: The aim here is to make a connection with the victim at top, evidence collected at bottom right and the suspects at bottom left. Also they have to be connected to clock (time of death) and the murder weapon (knife) that are at the center. The correct connection is seen by a green line. To deduce the murderer, all lines should be green from suspect to evidence as well as time and weapon; also from the victim to the evidences. 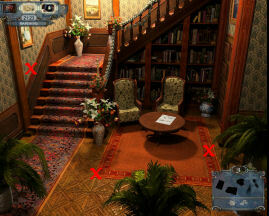 Do the suspects and see if they connect to evidences in each room-place (right). Click on an item from the suspect and see if it matched an item in the evidence frame by clicking on a similar item. For example: ashes with ashes, green cloth with green cloth or ribbon with ribbon or hair with hair. This way you then know who owns those evidence. The victim and suspect already have a green line connection. The victim and the time of death and knife also have a green line connection. 1. 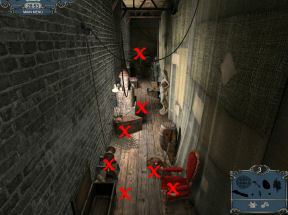 Click on Richmond Alley hideout at bottom right area. Click on the knife and then click on the knife at center of the frame. The knife in Richmond Alley hideout connects to the knife that is the murder weapon. 2. Click on the top footprint in Richmond Alley evidences and then click on the footprint of the victim at top of the screen. The top footprint in Richmond Alley hideout matches to the footprint of Vincent the victim. 3. Open Lord Layton on the suspects at left area. Click on the expensive cigar and then click on the cigar ash at evidences of Richmond Alley hideout. The cigar ash found behind the screen in Richmond Alley hideout matches the expensive cigar of Lord Layton. 4. 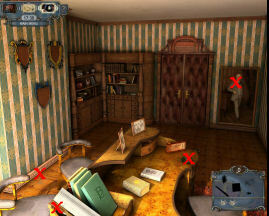 Click on opera paper of Lord Layton as suspect and then click on the clock at center of the screen. 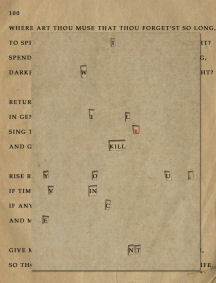 The opera paper of Lord Layton connects to the clock (time of death).